Open but in like new condition. MADE IN JAPAN N/OBI. DISC: Mint, no scratch, crack or slit on CD. Back Cover: Like New. CAT#: WPCR-10650. Alanis Morissette. Jagged Little Pill. "Original Album Series". In Praise Of The Vulnerable Man. Versions Of Violence. Citizen Of The Planet. This Grudge. Knees Of My Bees. [Catalogue#: DGR1894. 2012 South African Pressing of "Alanis Morissette - Havoc And Bright Lights" CD. This is however SEALED. Alanis Morissette - Havoc And Bright Lights. 09 ] Havoc. P.O. Boxes are preferred. Out Is Through 03. Excuses 04. Doth I Protest Too Much 05. Knees Of My Bees 06. This Grudge 09. Spineless 10. Ironic - Alanis Morissette. GRAMMY NOMINEES. Stupid Girl - Garbage. CD MADE IN BRAZIL 1997. IMPOSSIBLE TO FIND, POLYGRAM BRASIL FIRST PRESS 1997. ASK EVERYTHING YOU NEED TO KNOW AND I WILL ANSWER AS SOON AS POSSIBLE! Japan 13-trk samp|e CD WPCR-11110, no obi-strip. ・Grading Guide. Artist :Alanis Morisette. Title :Jagged Little Pill. New - Unplayed. Our inventory is always changing and you just never know what is on the shelves. Average - Has scratches and marks, plays perfectly. Catalogue#: WBCD 2103. 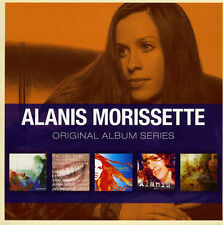 2005 South African Pressing of "Alanis Morissette - The Collection" CD. This is however SEALED. Alanis Morissette - The Collection. Country: SOUTH AFRICA. Hand In My Pocket. Alanis Morissette jagged little pill (1995). This item is NEW & SEALED and is the official Warner Music Taiwan release. RARE OOP JAPAN Alanis Morissette CD Supposed Former BONUS TRACK Uninvited Demo ! Uninvited (DEMO). OBI strip: a few small bends. Back insert: minor bending in lower left corner, otherwise great. That I Would Be Good 4:16. Japanese booklet: very good condition. Are You Still Mad 4:03. GRAMMY NOMINEES. 1979 - Smashing Pumpkins. Spiderwebs - No Doubt. CD MADE IN BRAZIL 1997. IMPOSSIBLE TO FIND, POLYGRAM BRASIL FIRST PRESS 1997. ASK EVERYTHING YOU NEED TO KNOW AND I WILL ANSWER AS SOON AS POSSIBLE! ALANIS MORISSETTE. " HEAD OVER FEET". CD MADE IN BRAZIL 1995. SINGLE MADE IN BRAZIL 1995. ASK EVERYTHING YOU NEED TO KNOW AND I WILL ANSWER AS SOON AS POSSIBLE! Alanis Morissette ‎CD MTV Unplugged. ♫♫♫♪♫♫♫♪♫♫♫♩♫♫♫♩. Head Over Feet. That I Would Be Good. You Oughta Know. King Of Pain. Important notices The item is used. Condition: Good. Die Hülle kann Gebrauchsspuren aufweisen. Alanis Morissette. The Unauthorised Edition1996. Interview Disc and Book. If you’re into the “warmth” factor, this totally defeats the point of having the recording in this format – you are basically just buying a lesser, imperfect version of a CD. Alanis Morissette ‎– Coleção Exclusiva Radio Rock Vol.2. Genre: Rock, Pop, Folk, World, & Country. Format: CD, Single, Promo. Style: Pop. Country: Brazil. Used: CD and insert in Very Good conditions. 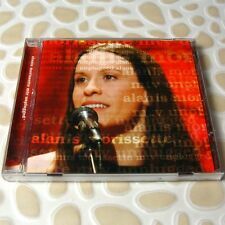 Alanis Morissette "Right Through You" CD ,Live 1995, original silver import CD from Italy. 1 Citizen Of The Planet 4:22. 4 Versions Of Violence 3:36. 6 In Praise Of The Vulnerable Man 4:07. OTHER PRODUCTS Check other products that we have available for sale. IF YOU HAVE ANY DOUBTS ABOUT THIS PRODUCT YOU CAN REVIEW THE PUBLISHED IMAGES IN DETAIL. 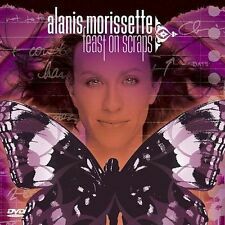 You Learn [Single] by Alanis Morissette (CD, Jul-1996, Maverick). UK IMPORT. Number W0334CD / WE 739. I have research that this number correlates with a UK manufacture. Indicates made in England with sticker on case. 2002 German CD. This CD Is In Excellent Condition . Rest Of World - £3.00 and £1.50 For Each Extra Item. Hand in My Pocket - 3:37. Head Over Feet - Live Acoustic - 4:07. We will reduce the amounts via the invoice. Condition: VERY GOOD -Original disc in CD case with all artwork / inserts. Not the Doctor - Live Acoustic - 3:57. Alanis Morissette ‎– MTV Unplugged. OTHER PRODUCTS Check other products that we have available for sale. IF YOU HAVE ANY DOUBTS ABOUT THIS PRODUCT YOU CAN REVIEW THE PUBLISHED IMAGES IN DETAIL. 12 Uninvited 4:37. 6You Learn (Acoustic Version)4:02. 5Not The Doctor (Acoustic Version)4:00. Alanis Morissette - Under Rug Swept. 2002 Maverick Enhanced CD Album. Disc:- EXCELLENT/MINT! Liner Notes - Very Good. CD Case - Very Good. A RARE Alanis Morissette Import CD - Right Through You recorded in 1995. 8 Wake Up 4:54. 2 Right Through You 6:40. 12 Right Through You 4:09. 5 You Learn 5:17. 7 You Oughta Know 7:01. 4 Ironic 3:56. 11 Hand In My Pocket 5:34. ALANIS MORISSETTE Jagged Little Pill ​First Edition THIS IS AN ORIGINAL 1995 USA RELEASE TRACKS: 1 All I Really Want 2 You Oughta Know 3 Perfect 4 Hand In My Pocket 5 Right Through You 6 Forgiven 7 You Learn 8 Head Over Feet 9 Mary Jane 10 Ironic 11 Not The Doctor 12 Wake Up CD: EXCELLENT INSERTS: EXCELLENT. A wonderful 5 disc singles boxed set with rare and unreleased b-sides. Includes rare live and studio accoustic performances. VERY GOOD CONDITION "UNDER RUG SWEPT" BY ALANIS MORISSETTE. Ironic [Single] by Alanis Morissette (CD, Feb-1996, Maverick). Import / Made in France (indicated on insert). Ironic (3:47). RARE OOP IMPORT CD . Condition: CD is EXCELLENT with light wear. Insert is Very Good.